Shrubs or small trees , deciduous, to 5 m. Roots not adventitious. Bark grayish, slightly roughened. Branchlets pubescent. Leaves: stipules 1-1.2 cm; petiole 8-20 cm. Leaf blade obovate, nearly orbiculate, or ovate, palmately 3-5-lobed, 15-30 × 15-30 cm, base cordate, margins undulate or irregularly dentate, apex acute to obtuse; surfaces abaxially and adaxially scabrous-pubescent; basal veins 5 pairs; lateral veins irregularly spaced. Syconia solitary, sessile, green, yellow, or red-purple, pyriform, 5-8 cm, pubescent; peduncle ca. 1 cm; subtending bracts ovate, 1-2 mm; ostiole with 3 subtending bracts, umbonate. Flowering spring-summer. Disturbed sites; 0-300 m; introduced; Calif., Fla., Mass., N.C., S.C.; Mexico; West Indies; native to Asia. 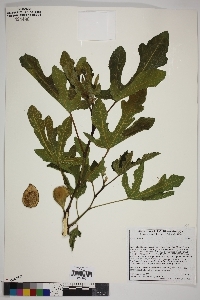 Ficus carica is known to escape in Alabama, Louisiana, Texas, Virginia, and West Virginia, although no specific localities are documented. Ficus carica was first known from Caria in southwestern Asia. It is cultivated for its edible fruit and becomes established outside of cultivation only sporadically in the United States. It can sometimes be found persisting around old habitations and old orchards.